We are one of the most prominent names in the industry known for manufacturing an extensive range of Pre-Fabricated Factory Sheds. Our team of experienced engineers has in-depth knowledge about the precise designing of these sheds. We use premium quality raw material for the manufacturing of these sheds to ensure durability. To furnish the diverse requirements of our clients in the best possible manner we are involved in offering an extensive range of Prefabricated shed. 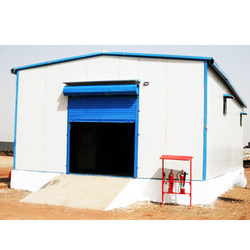 We provide pre fabricated steel factory sheds as per the customer choice and preferences. Used widely in variegated industries, our factory sheds are known for their sturdy build, low maintenance and easy installation. In order to manufacture superior quality sheds, high grade raw material, procured from trusted vendors of the market, is used. 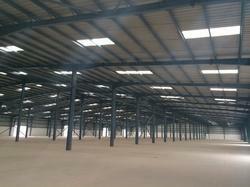 Factory shed PEB Pre Engineering Building Structure and Porta cabins at lowest price call for bulk requirements. We are a noteworthy entity in the industry, actively committed towards manufacturing an optimum quality Prefabricated Shed. We are the renowned names of a wide efficient range of Structural Steel Prefabricated Shed , designed as per modern trends of the industry. Roofmax Metal Storage sheds provide versatility and creativity to bring new and refreshing design that result in significant cost saving by easy framing system. Our Metal Storage sheds are resistant to extreme weather conditions and good heat reflection properties. We specialize in manufacturing and supplying a wide variety of Prefabricated Sheds for Factory designed as per the specification of the clients. These machines ensure high durability, tensile strength and sustainability. We have marked a diverse and vigorous position in the market by offering a supreme quality collection of Pre Fabricated Factory. The provided building is fabricated and developed by our talented professionals using supreme grade material and cutting-edge techniques under the visionary supervision of skilled professionals.